Product code: W1520 Categories: Rolex Watches, Watches. Here is a ladies 9 carat rose gold Art Deco Rolex made in 1932 that is so elegant and refined and characteristic of not just the beautiful design that was created by Rolex but also exemplifies the wonderful Art Deco era in which this watch was made. The tonneau shaped case measures 14.2mm across plus the crown, by 24.9mm to the edge of the case or 35.4mm to the end of the watch lugs where the band is attached to, making this such a lovely and feminine size that looks perfect day or night. 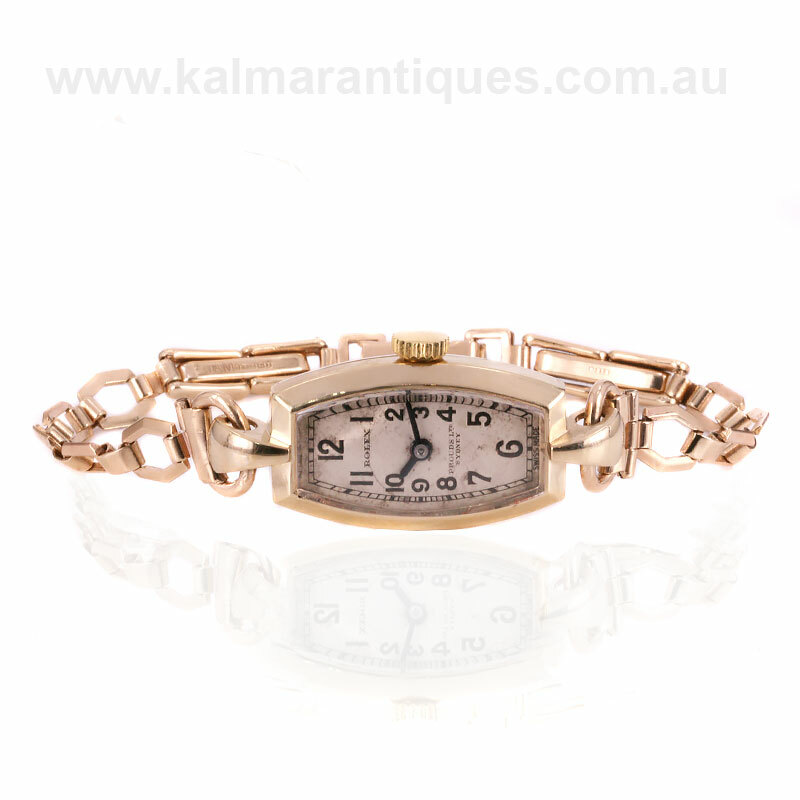 Fitted on a 9 carat rose gold band that is so easily adjustable at the clasp section, this allows the watch to sit so well on the wrist where it will no doubt always be admired. Inside is the beautiful 15 jewelled manual wind Rolex Prima movement which has been completely serviced, runs beautifully and comes with our twelve month warranty. 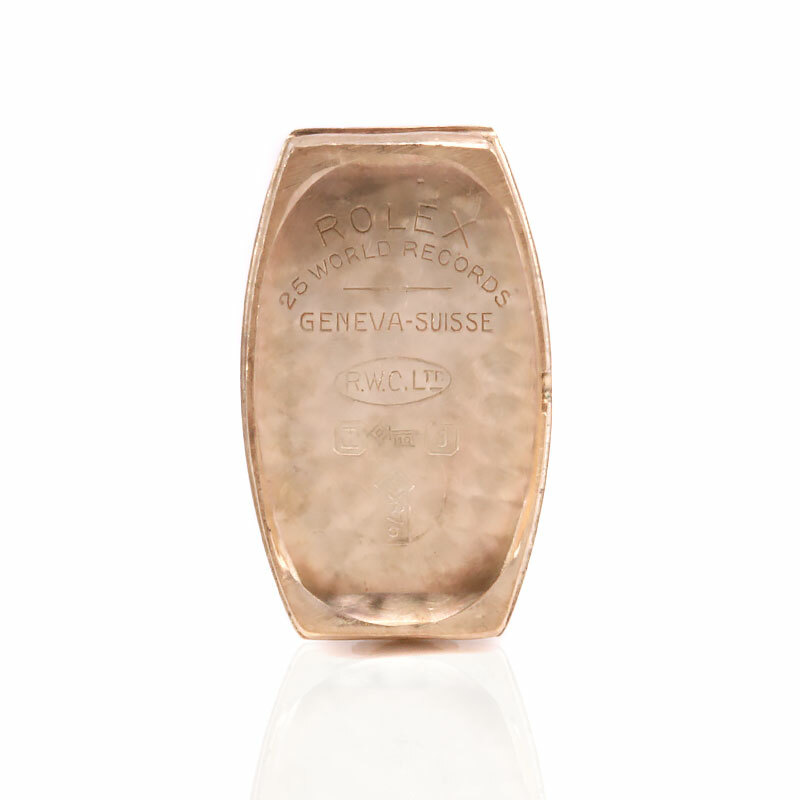 Perfect for that special dinner or occasion, this is not just a vintage Rolex from the Art Deco period, it is also a piece of jewellery thanks to its elegant design. The Rolex Prima movement were the first to use a new series of balances for greater accuracy and reliability. First introduced in 1928, they came in three classes, the Prima, Extra Prima, and Ultra Prima manual wind movement. These precise movements were adjusted to 6 positions and at all temperatures, the specification for a chronometer rating.